Despite being a big sprawl, Los Angeles remains one of the most attractive cities to visit in California. It’s hard to run out of things to do in this exciting metropolis. But if you have more time and are looking for some weekend getaways from Los Angeles, you’ll be glad to know there are plenty of beautiful places within two hours drive from the city. I’ve been living here for 30 years and still didn’t discover all of them. Celebrities, beaches, wine, red tiles and beautiful gardens are just some of the things that made the relaxed town of Santa Barbara famous. Most visitors coming to Santa Barbara spend their time near the beach or around the fancy boutiques and restaurants along State Street. But there is a lot more to this beautiful coastal town nestled in the slopes of the Santa Ynez Mountains. 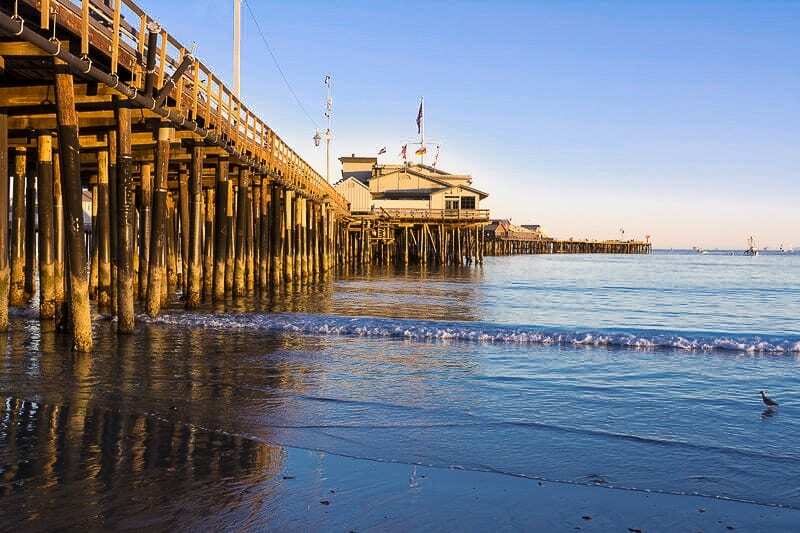 Things to do in Santa Barbara: some of the attractions you shouldn’t miss in Santa Barbara include the Courthouse with its beautiful clock tower, the Stearns Wharf which was the longest deep-water pier between Los Angeles and San Francisco, and the Old Mission. Solvang will surely steal your heart with its European-style windmills, flower-lined streets and Danish architecture. The first time I visited the village I remember feeling like I was walking in one of Hans Christian Andersen’s stories. Half timbered buildings, horse-drawn wagons, storks on the rooftops. Clogs and Danish bonnets in the windows. Everything in Solvang is reminiscent of the old Danish countryside. The little town of Solvang was the dream of three Danish immigrants who planned to established here a Danish community. In 1911 they bought 10,000 acres of land next to the beautiful Santa Inés Mission in Santa Barbara County, California. They named the new settlement ‘Solvang,’ which in Danish means sunny field. Things to do in Solvang: the town is an attractive destination for food a wine lovers. From farm-to-table rustic Italian cuisine, American and Danish foods, to award-winning beers and world-class wines, there are plenty of temptations for your taste buds here. Not surprisingly, you’ll find many shops with cute European sweets and souvenirs. And while in Solvang, you may want to check out the cute neighboring town of Los Alamos, just 25 minutes away. There are quite a few things to do in Los Alamos as well, if you can spare a few hours. If you are a beach aficionado, Long Beach will make a great weekend getaway for you. The city has not only beautiful beaches, but more music and festivals than any other place in Southern California. Long Beach is also famous for its great dining and entertainment scene, including famous bars and live music venues. One of the most famous annual events in the city is the Toyota Grand Prix of Long Beach, which takes place every April. The downtown streets turn into a race course watched by thousands of people. Things to do in Long Beach: There are many exciting things to do in Long Beach, besides beach going. You can rollerblade, bike, dine in style, or simply browse the quirky boutiques in the Shoreline Village. 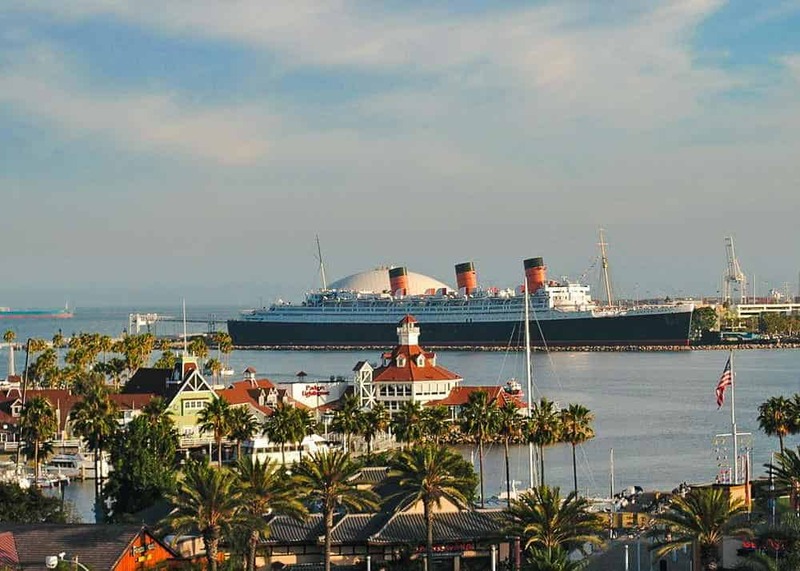 But one of the most unusual things to do in town is visiting the Queen Mary, the retired British ocean liner that is now permanently docked in Long Beach. The ship functions as a hotel and can also be visited. Queen Mary is rumored to be haunted, so those who aren’t afraid of ghosts can take a nighttime ghost tour. Another great attraction in Long Beach is the Aquarium of the Pacific. The Aquarium is home to over 12,000 pacific coast creatures, among which sea otters, sea lions, seals and penguins. If you want to see beautiful beaches in Southern California you should go to Orange County. 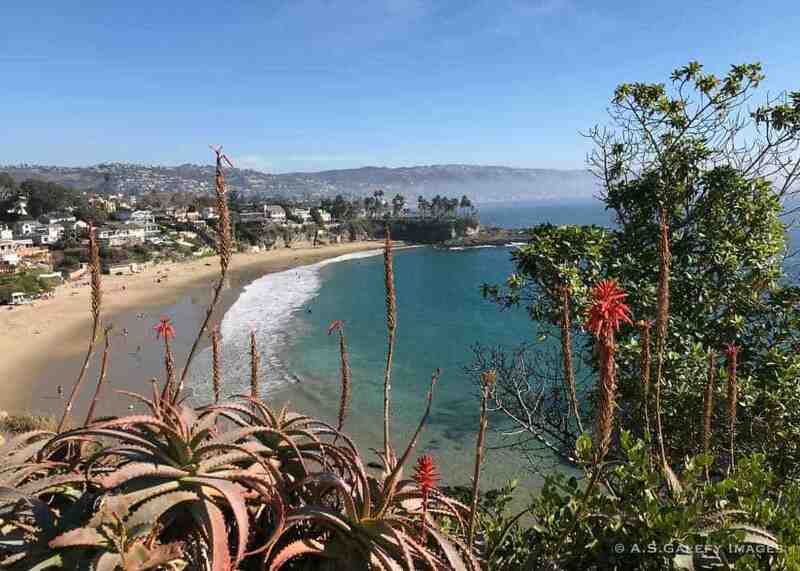 One of the most sought after Los Angeles weekend getaways is the small coastal town of Laguna Beach, in Orange County. 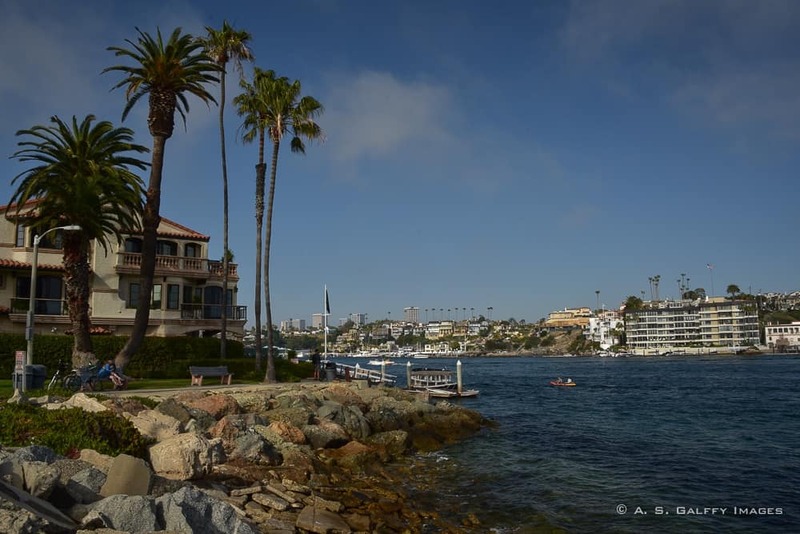 Laguna Beach is known for its many art galleries, coves and gorgeous beaches. What makes the beaches of this town so special are the many tide pools you can find along the coast. The waters off Crystal Cove State Park are designated as an underwater park. Most visitors of Los Angeles come to Laguna Beach for the beautiful beaches, fancy boutiques, art galleries and great restaurants. But very few ever heard of the living pictures, a live performance that you can’t see anywhere else in the world but here. The Pageant of the Masters at Laguna Beach, as it is known, is one of the most amazing and unique art displays that you will ever see. The summer-long festival is held for eight weeks beginning July. The Pageant consists of 90 minutes of “living pictures” narrated by a professional narrator, with great period music performed by professional vocalists and orchestra. Things to do in Laguna Beach: if you come in summer, you should definitely check out the beaches and the Pageant of the Masters Festival. The shops, art galleries and restaurants are great at any time of the year, even in winter. Distance from L.A.: Laguna Beach is about 50 miles away from Los Angeles (1 hr via I-5 S). If you want to get away from the hustle and bustle of big cities and don’t mind spending a little time on the water, there are a couple of island trips you could take. Catalina Island makes one of the most exciting weekend getaways from Los Angeles. It’s a world apart from the frenzy of the mainland. Visitors come to Catalina to enjoy not only the beautiful beach, but also the varied flora and fauna of this island. The underwater world is especially beautiful at Catalina. 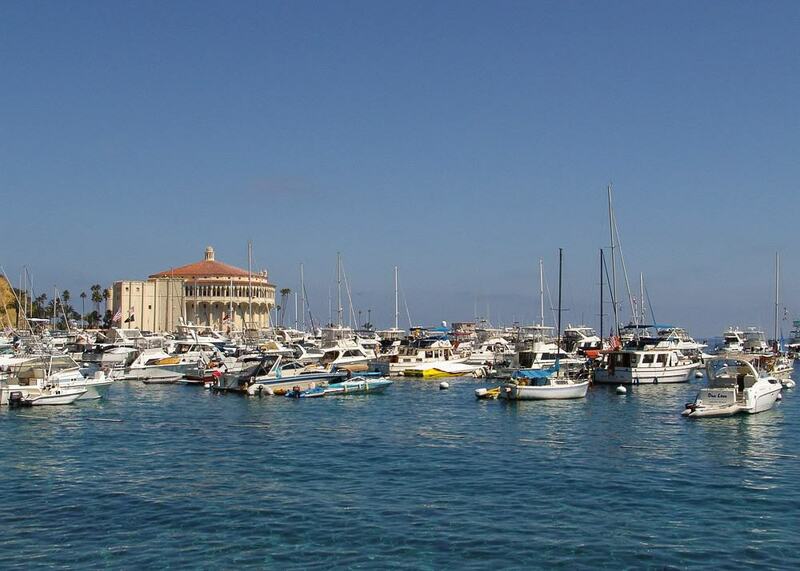 Avalon is the gateway to the beautiful interior of Catalina Island and the most visited destination on the island. All boats from the mainland stop here. The boat trip is a big attraction in itself, taking you through the blue waters of the Pacific richly populated with dolphins, sea otters and seals. Things to do on Catalina Island: from diving and snorkeling, to sun bathing, boating and hiking, there is a great array of outdoor activities and things to do on Catalina Island. If you want to see the interior of the island, the local tour companies organize many guided tours and expeditions. You can find out about the history of Catalina and see the undeveloped outback of the island. Distance from L.A.: Santa Catalina Island is 47 miles away from Los Angeles. The boat for Catalina departs from Long Beach Harbor and takes about an hour to cross the channel. You can also take a combination of shared shuttled and ferry that will transport you from downtown Los Angeles to Catalina Island and back. Balboa Island is a small artificial island in the middle of Newport Harbor. 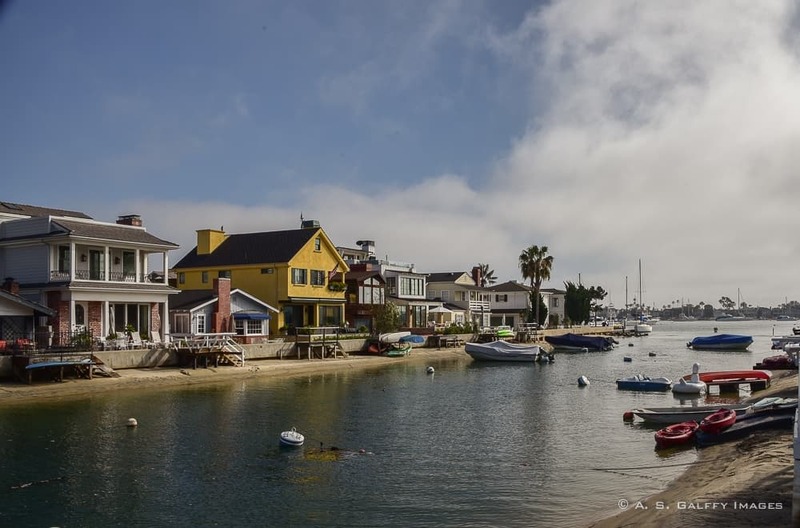 The island is connected to the mainland by a short two-lane bridge and a privately operated fleet of three ferryboats (Balboa Island Ferry) which provide access across the harbor to the Balboa Peninsula. Spending a day on Balboa Island was one of my favorite things to do when we first moved to California. Its lovely location in a sheltered bay along the coast of Orange County, the water canals surrounding it, the private docks harboring expensive yachts or just little motor boats, the chic little cottages lined up neatly along the shore, all these things made the island appear glamorous and exquisite. What to do on Balboa Island: shop at the chic village boutiques; have lunch or dinner at the nice restaurants on the Main Street; say ‘hello’ to the friendly locals relaxing on their porches; watch kids scooter and young people jog on the boardwalk that wraps around the island. Walking the entire island will amount to about 2.5 miles and it’s a pleasant way to spend the day. Many people think the North American Desert region is this arid land where nothing grows. But in reality this desert hides a lot of nice surprises. It can be stunningly beautiful, quite green and really enjoyable. You just have to choose the right place and the right time to visit. There several beautiful weekend trips from Los Angeles that you can take if you want to see the desert. If you’re looking for a desert getaway with endless sunshine, mid-century modern architecture and a laid back lifestyle, you should go to Palm Springs. Palm Springs is arguably the most famous desert retreat in Southern California. Despite being located in the middle of the desert, Palm Springs is a year-round tourist destination. The city became a fashionable resort in the 1900s, when tourists arrived here with conditions that required dry heat. Today Palm Springs an outdoor playground for wealthy retirees and a celebrity hangout. Things to do in Palm Springs: from biking, golf, hiking, horseback riding, swimming, dining and shopping you can do just about anything in Palm Springs. Some of the attractions include the Palm Springs Art Museum, an Aerial Tramway trip to the top of San Jacinto Mountains, and visit to the Living Desert Zoo and Gardens. Distance from L.A.: Palm Springs is about 108 miles east of Los Angeles (1 h 43 min via I-10 E). A big part of the desert’s beauty is its harshness and Joshua Tree National Park is proof for that. The Park is an oasis in the center of the desert. There is beauty in the silence and solitude of these rugged rock formations, the cholla cactus and colorful light of morning. But you can’t appreciate the uniqueness of Joshua Tree National Park until you spend some time in it. The west entrance to Joshua Tree National Park, located just off of Highway 62, is the most popular gateway to the park. 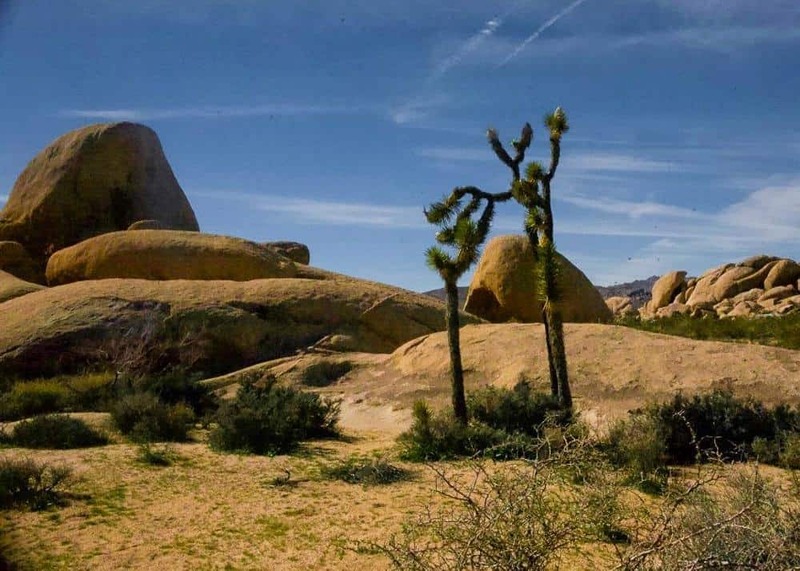 This part of the park is populated with 20-foot tall Joshua trees, massive boulders and enough photo opportunities to fill an entire day. From October to April, the park becomes the playground of rock climbers from around the world, who flock to Joshua Tree to climb its unique boulders. 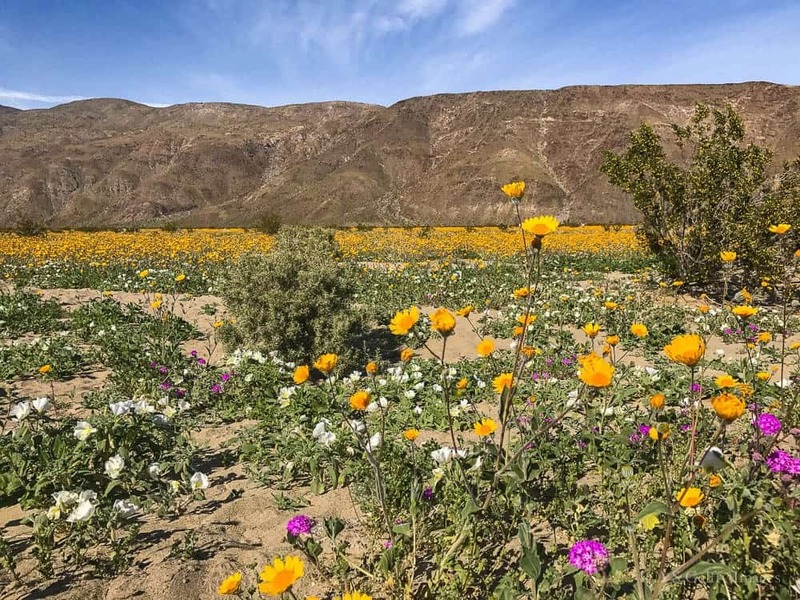 Things to do in Joshua Tree Park: if you visit the park during the spring you can admire the blossoming vibrant wild flowers. Hiking and rock climbing the most common activities in the park. Distance from L.A.: Joshua Tree National Park is 132 miles away from Los Angeles (2 h 12 min via I-10 E). If you happen to visit Los Angeles in spring, you should attempt to take a trip to the Anza Borego Desert State Park. This area may not be very friendly in the intense heat of summer, but in spring Anza Borego looks more like a garden than a desert. The desert is in bloom every spring, from February through March or April. However, seeing a super bloom is rare. It only occurs if we had a rainy winter, which unfortunately doesn’t happen every year in Southern California. Visitors from as far as Europe, Africa and Asia are coming to Anza Borego to see the desert in bloom. Things to do in Anza Borego Desert State Park: hike the Palm Canyon Trail (trailhead is not far from the visitors’ center), watch the wildlife, take pictures. Distance from L.A.: Anza Borego State Park is 155 miles from Los Angeles (2 h 40 min via CA-79 S). Not many visitors to Los Angeles know that less than a couple of hours away from the busy downtown area you can find yourself in a wild and remote world, that has its own microclimate. Temperatures in the San Bernardino mountains are sometimes 20-25ºF cooler than the ones down in the Valley. In winter, these mountain communities get lots of snow. It’s not unusual to go skiing in Big Bear in the morning and surfing in the afternoon in Santa Monica. You’ve probably heard about Big Bear Lake in the San Bernardino National Forest – the largest recreation lake in Southern California. Locals love coming there for a weekend! However, I would like to suggest to you the next door Lake Arrowhead instead. This stunningly beautiful reservoir lake may be smaller, but is actually much nicer and quite peaceful. 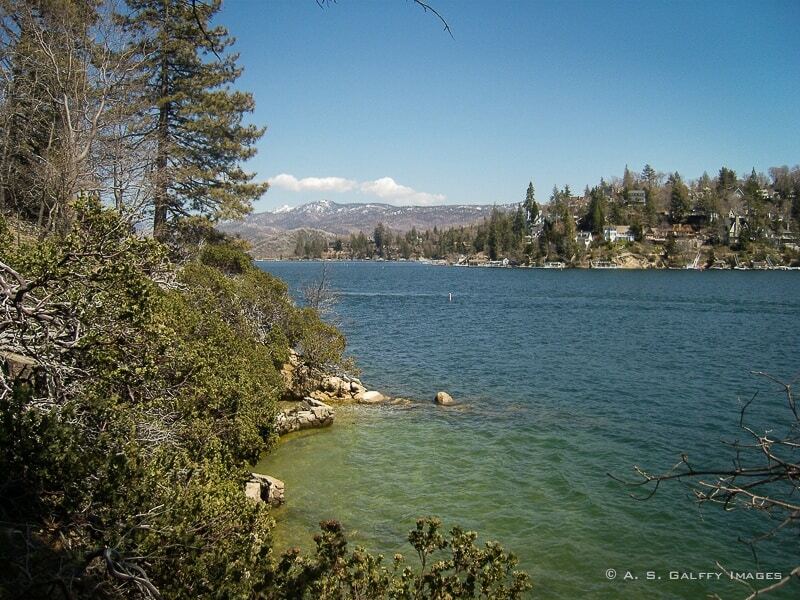 Things to do here: Lake Arrowhead is a countless resource of recreational activities. From hiking, horseback riding, bicycling, to swimming, water skiing and lake tours and fishing you can do just about anything. For those who come here off season, there are many options for great dining and shopping. The views from the hills around LA are magnificent, indeed. So many places to see in LA - this is a great list indeed! I would love to stay in LA for 2 weeks and gradually explore all these places. Whether it's Balboa Island or Solvang or Laguna Beach, I want to head everywhere. They all look so pretty, so cannot afford to miss them. I would never associate Los Angeles with Danes. Somehow, I would think of them fitting somewhere on the East Coast. Do not ask me why, though. Hence, Solvang would be my choice for a weekend getaway. An unexpected treat of Scandinavian coolness in a subtropical land. Great list I’m caught up with the Anza Borego Desert State Park looks like a freat place for hiking especially wheb the wild flowers are in bloom it must be so beautiful on that time. Reading this makes me miss the years we lived in Los Angeles. We took advantage of our time living there and hit quite a few spots mentioned in your article. The one place we didn't get a chance to visit was Joshua Tree National Park. It's still on the list :) Great recommendations for quick getaways. Solvang looks and sounds like it's a city in Europe, not California! I've never heard of it before and look forward to checking it out next time I'm out there. I also really want to go diving off the Catalina Islands, so that's on the list too! There are so many incredible beach towns in and around LA, which is really giving me some location envy considering how frigid it still is in Chicago right now! These are great suggestions! My sister and many of my family live in the Greater L.A. area, so I’ve been there many times and have gone to most of the places listed here. Solvang is really cute (stopped every time we deive ip to SF) and Palm Spring is awesome too (love that outlet!). However I haven’t been to Catalina and Balboa islands yet! So hopefully next time! Going through that list, it makes me feel bad I only spent 2 days in LA and I didn't manage to tick much off. But I did get to see the Joshua Tree National Park, which was amazing! I am flying to LA in 3 weeks and just excited to explore the area. These are indeed wonderful getaway ideas. Would love to enjoy and visit the Balboa and Santa Barbara. Great! You'll have plenty of time so take a weekend trip then. Ahhh, so many cool places. I so regret I didn't explore the Southern California area more when I lived in San Francisco. Joshua Tree and Solvang had always interested me, but I just never made the time. Not all is lost, Vanessa. You can always return to Southern California for more. I've been living here for 30 years and still get to explore all there is to see. This is definitely going to ask for many weekends. I will pass on this to my friends who live in and around LA. I haven't been there. 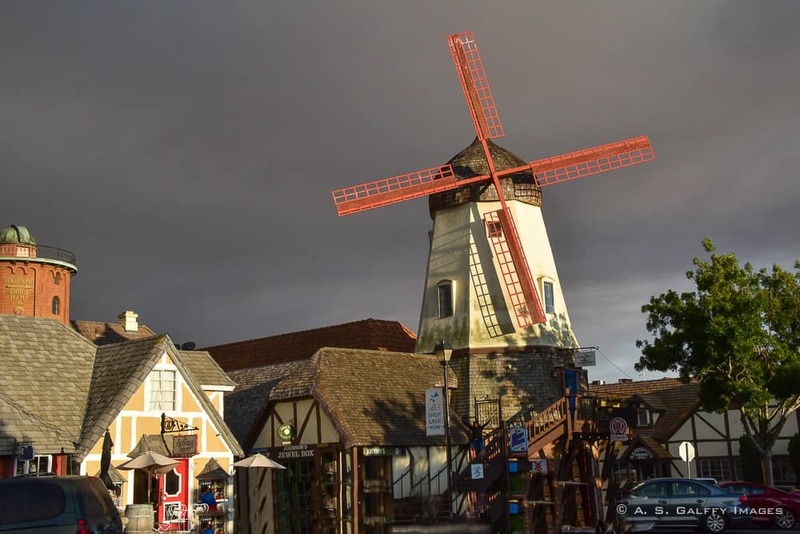 The moment I saw the European styled windmill in the picture, it reminded me of Hans Christian Andersen’s stories and there you said it about Solvang. The beaches look so inviting. Laguna beach looks great. And of course why miss the Joshua Tree National Park. Great list for sure. I am not a local, but I have done all these trips when I was in LA. Definitely, this is a great selection, Anda! Southern California is such a treasure trove of things to see and do. I've done a few of these - Solvang, Santa Barbara and Palm Springs - and would love to do the rest. Great ideas, Anda. I absolutely loved Califonia when I visited over ten years ago. We did go to Laguna Beach, which was lovely, but I had no idea there were so many more amazing options for short trips available. This Anza Bordego Desert State park looks absolutely fascinating. But I reckon most of these sites are not accessible with public transport, right? I'm feeling all inspired to visit California again now! It's been a long time since I was in the state, and I love these day trips you mentioned. Solvang looks so European, and I can see the Danish roots there! Balboa Island looks so pretty too, I'd definitely make a stop here. 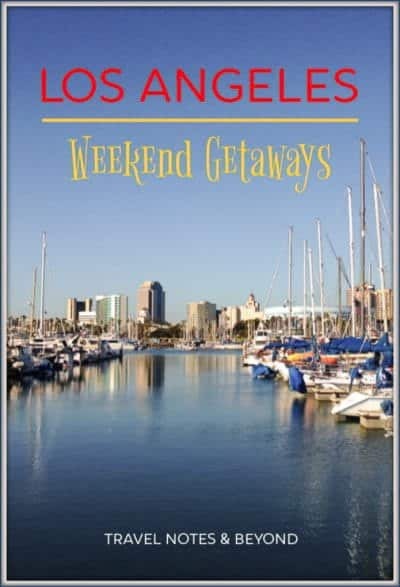 LA is not high in my list, but this idea of places to visit for weekend getaways change it a bit. Lots of beautiful and interesting places surrounded the city, and all are under 3 hours drive. Obviously, Solvang and Lake Arrowhed will be high in my must visit list. Such a stunning view in santa Barbara and the Long Beach. I have never visited Los Angeles but I wish to visit. The windmill sounds good as well, I have never seen something alike. Hope you'll get to visit Los Angeles someday, Raghav. There is so much choice for a weekend getaway. I have not spent enough time in Los Angeles and need to return to visit some of these places. High on my list would be to see the windmills in Solvang, the Queen Mary in Long Beach and the Joshua Tree. This is a great list. Thanks, Jane. Southern California is such a great place to visit.